Harvest for Healthy Kids is a community-based participatory research (CBPR) project between Mt. Hood Community College (MHCC) Head Start and Dr. Betty Izumi at the School of Community Health, Portland State University. Modeled after the "farm-to-school" concept, Harvest for Healthy Kids is a nutrition intervention designed to introduce children in early care and education settings to a wide variety of locally grown fruits and vegetables through their meals, snacks, and classroom activities. 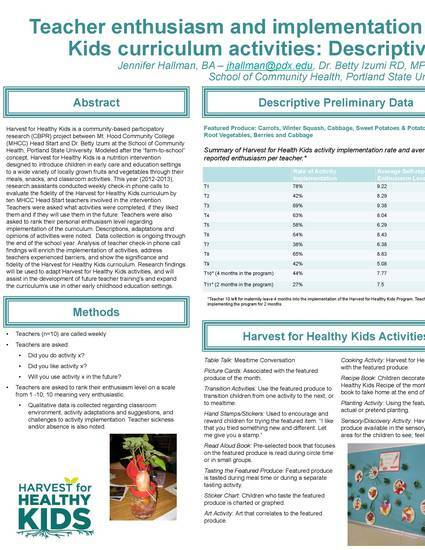 This year (2012-2013), research assistants conducted weekly check-in phone calls to evaluate the fidelity of the Harvest for Healthy Kids curriculum by ten MHCC Head Start teachers involved in the intervention. Teachers were asked what activities were completed, if they liked them and if they will use them in the future. Teachers were also asked to rank their personal enthusiasm level regarding implementation of the curriculum. Descriptions, adaptations and opinions of activities were noted. Data collection is ongoing through the end of the school year. Analysis of teacher check-in phone call findings will enrich the implementation of activities, address teachers experienced barriers, and show the significance and fidelity of the Harvest for Healthy Kids curriculum. Research findings will be used to adapt Harvest for Healthy Kids activities, and will assist in the development of future teacher training's and expand the curriculum's use in other early childhood education settings.